Baba decided to build His first HoPE Town in Manilla (Philippines) in Bagong Silang, a slum inhabited with over 1 mllion people. Here is a look at some of the families and their homes in Bagong Silang. You can also take the HoPE Town Photo Tour and see what the HoPE Town site looked like before by clicking HERE: HoPE Town Photo Tour! This hole in the ground was actually a community toilet shared by 12 families! Dr Pillai (Baba)’s charity organisation, the Tripura Foundation, decided to build 30 homes for 30 families from donations collected from Dr Pillai’s students and devotees globally. 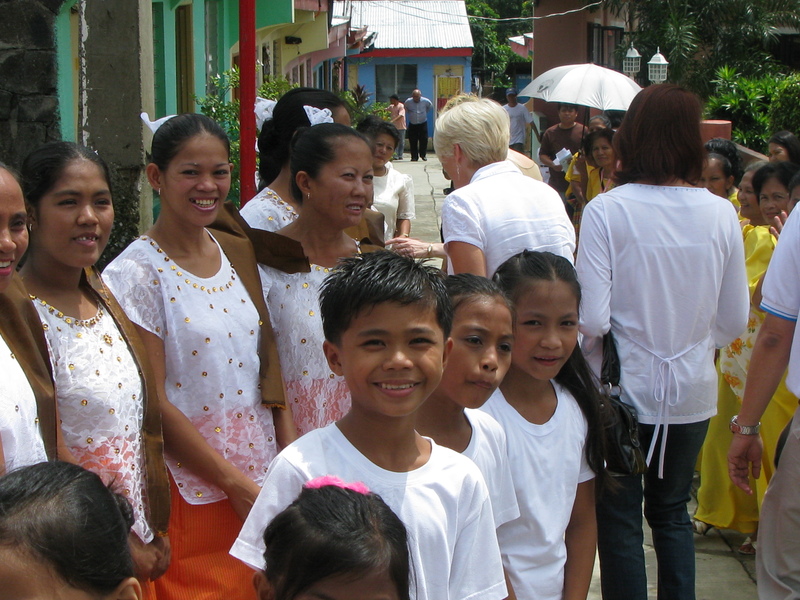 The Tripura Foundation partnered with Gawad Kalinga, a Philippines NGO that has been building homes for the poor for the last 15 years. Each home cost an amazing US$2,000 only! Donors contributed money specifically for a house or any amount towards helping build a home. During Guru Purnima 2009, Dr Pillai (Baba)’s community in Singapore (with contributions from Baba’s Malaysian and Philippines devotees also) gave with their hearts and collectively, we raised US$30,000 towards HoPE Town in just a few short weeks . The Tripura Foundation held the ground-breaking ceremony for Dr Pillai (Baba)’s HoPE Town in August 2009. A few of us, together with Baba’s devotees from the Philippines and the UK, visited Manila to attend the ground-breaking ceremony at Bagong Silang. This is what a HoPE Town House will look like! These children are the future of Baba’s vision of Heaven on Earth. Although the children of Bagong Silang live in a slum, these sweet souls were friendly, playful and had a cheerful optimism that shone from their hearts! After 1 year of construction, Baba’s HoPE Town Manila is finally ready and the beneficiaries have already moved in to their new homes! Join me in Part 3 as we unveil the houses that you helped build with your generous donations. I will also share with you the heart-warming letters of gratitude from some of the beneficiaries whose destinies (and that of their succeeding generations) have been transformed with your simple gift of a house to them.